The so-called Islamic State promises to bring sharia law to Britain in its latest snuff film, which features an English-speaking child and an apparent reboot of the group’s infamous “Jihadi John” figure. 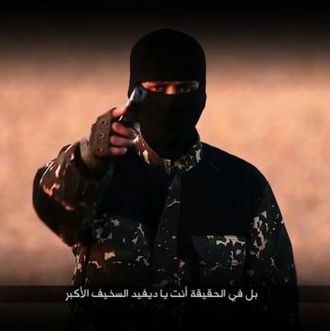 Born Mohammed Emwazi, “Jihadi John” became the balaclava-shrouded face of ISIS when he executed American journalist James Foley in the group’s first widely circulated video. A British citizen, Emwazi appeared to enjoy some success as a propagandist — at least 700 Britons have traveled to support jihadist insurgencies in Syria and Iraq, according to the BBC. The United States believes that it killed Emwazi in a November drone strike. But a new actor appears to keep the role alive in the terrorist organization’s new, as-yet-unverified video. Near the end of the ten-minute film, a small English-speaking child echoes this promise of invasion, saying, “We will kill the kuffar [non-believers] over there,” while pointing into the distance. Before the child’s send-off, the video appears to document the execution of five captives, each shot through the back of the head while kneeling in an orange jumpsuit. The men are labeled as British informants, who have provided Western authorities with information about the location of ISIS fighters. But even if ISIS is losing its jihad, some experts believe the group’s new video shows that they still know how to win a news cycle.